Muscoot Farm is one of the jewels of the Westchester County Parks system. It welcomes tens of thousands of visitors every year to both the Farm and the trails. Thousands of children from school and camp groups are educated through the interpretive farm and excellent farm staff and volunteers. Every Sunday from May – November there is a Farmer’s Market from 10-3pm. 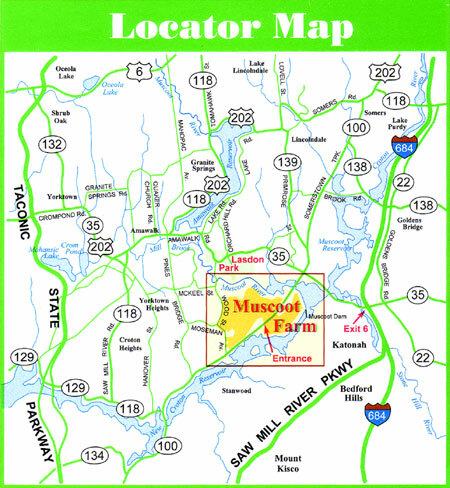 Muscoot Farm is located at 51 Route 100 in Katonah, NY 10536. Muscoot Farm was originally a “Gentleman’s Farm” owned by the Hopkins Family and used as their summer estate and dairy farm from 1880 to 1924. In 1924 the family moved to the farm year-round and continued the dairy business until 1967 when Westchester County acquired the property. Today, Muscoot Farm has many of the original buildings, some of which were moved in the late 1800s to accommodate the filling of the Muscoot Reservoir. Visitors can walk through the Dairy Barn, Milk House, Ice House, BlacksmithShop and several other barns and buildings. Livestock and poultry are breeds typical of an early 20th century gentleman’s farm and many represent minor (rare) breeds. Muscoot Farm is an early-1900’s interpretive farm owned and operated by the Westchester County Department of Parks, Recreation and Conservation. Muscoot Farm is open year-round and offers a full schedule of programs for families, as well as tours, farmyard visits and hayrides for groups by reservation. More than seven miles of hiking trails allow visitors to explore some of Muscoot’s 777 acres through fields, woodlands and wetlands. Trail maps are available in the Reception Center.